As I was driving back from my most recent trip to Mississippi, I was listening to Kid Rock when the song “Roll On” came on and I found myself relating to the lyrics below. When I moved to Chicagoland a little over 13 years ago I walked away from the only life I had known, left my family, my friends and I didn’t know if, or when, I would be going back home. Sure, I knew there would be the typical holiday or vacation visits, but I had no idea if I would ever actually move back to the South. I was simply living in the moment and wasn’t looking that far into the future. All I was thinking about was finding a job and figuring out how to navigate all of the new roads, not just the ones with Chicago traffic, but the new ones I was venturing down in life. The past 13+ years haven’t all been easy, but looking back on them I definitely can say that I had a good time. I made some good great friends, worked for some amazing companies, met my wife, her two awesome kids, Ashlee and Jake, and got the best dog in the world, Savannah. 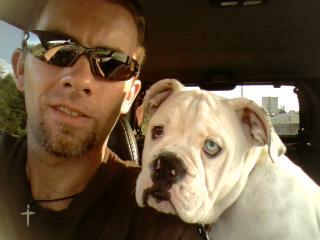 Hey Daddy, I’m glad you are my Daddy. I got to help Ashlee learn how to ride a bike, coach her basketball teams and watch her grow into the beautiful, responsible woman she is today. We had some rough moments over the years, but every time I hear about her “doing something like Jason” it makes my heart feel good. I’ve seen Jake grow from not knowing how to throw a football to watching him play football from the time he was 8 years old all the way through high school. 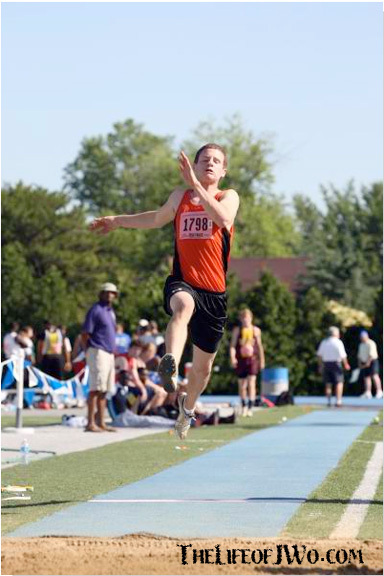 I got to see him jumping off the top ropes while we wrestled and watched WWE to seeing him compete at the Illinois state championship in the long jump. He’s grown and matured so much over the years and now I’ve seen him get accepted into the University of Kentucky. Even though I know I didn’t show it as much as I should, I have always proud of him and thankful he is a part of my life. 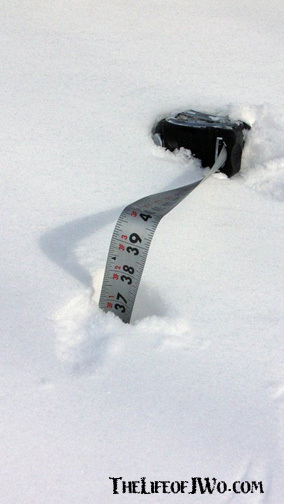 Yes, that says 37 inches of snow. I’ve seen and shoveled more snow than I could have ever imagined. 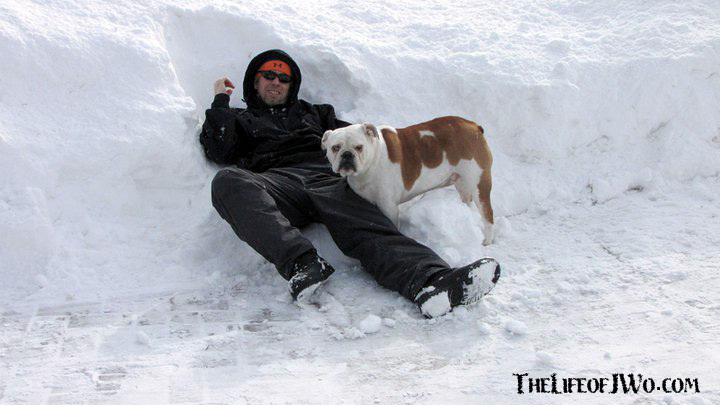 I even spent the first 10 years moving it without a snow blower. I’ve even learned how to drive in snow that would bring cities down South to their knees. Savannah always loves playing, running and eating snow. I got to see Joe Paterno lead Penn State against Northwestern, which at the time seemed like a much bigger deal than it does now. 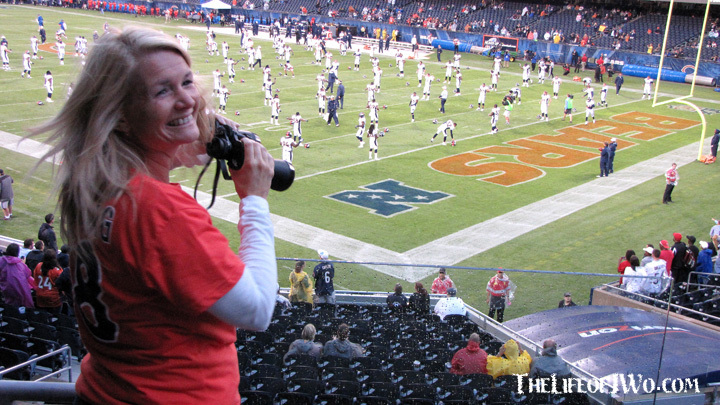 Tammy got to see Peyton Manning’s first game (preseason) as a Denver Bronco. I see him!! I SEE HIM!! I prolly went to more concerts in the past 13 years than I did in the previous 26. 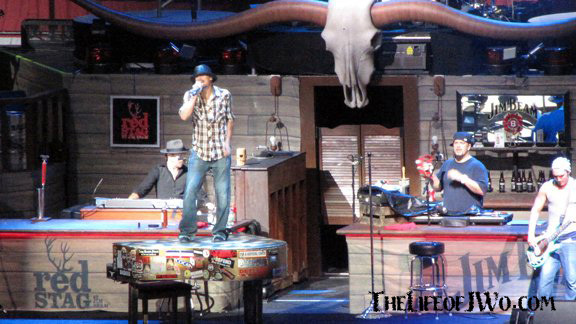 I’ve seen Kid Rock 6 or 7 times. 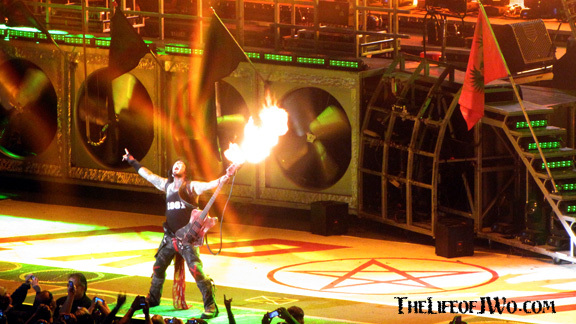 I finally got to see Nikki Sixx and Motley Crüe. 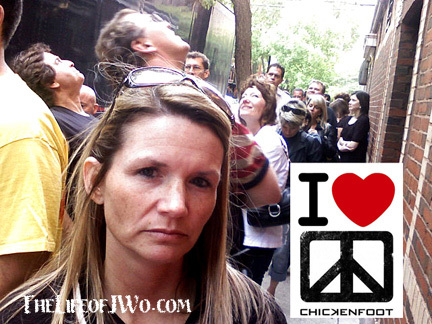 I lost count of how many times I’ve seen Sammy Hagar, but Tammy knows how many times we saw Chickenfoot… one. Don’t let her look fool you, she hearts the ’foot. 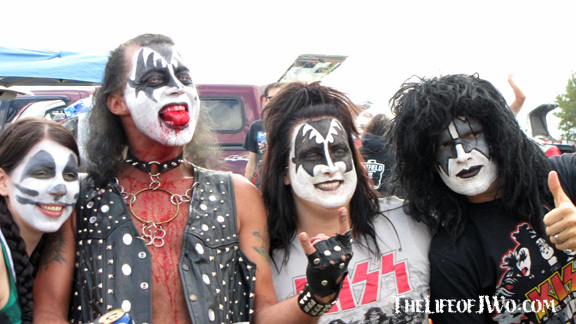 We got to see KISS and the KISS Army. The band I’ve wanted to see but haven’t been able to yet is Jimmy Buffett. We usually have our vacations planned for the times he’s in town. The one time we actually got tickets we ended up not being able to go. Someday I hope to be wastin’ away in Margaritaville. The past 13 years are full of stories, some good, some bad, but each one of them are what has helped make me who I am today. I’ve grown and learned more about myself in the past 13 years than I would have ever thought was possible. I’ve made changes in my life that have helped me become a better man, and more importantly a better husband. I was laid off a little more than a year ago and spent the last 12 months looking for a permanent job while filling the gaps with some freelance work. I’ve written all of this not just as a trip down memory lane, but also to let everyone know that I have gotten a new job, in Memphis, Tennessee (I put a “clue” about the news in the header yesterday, showing Memphis’ skyline). It’s over nine hours away from where I’ve spent the past 13 years, but 90 minutes away from where I spent most of my first 26 years. It’s going to be sad to leave Tammy’s family and our friends behind, but we are both very excited about this new chapter in both of our lives. My first day is at the end of the month which means we’re going to have a very busy next couple of weeks. I’m also sure that there will be plenty of blogging material while I pack, Tammy’s already told me it’s going to “annoy” her. I just hope I’ll have time to write about it. To all of our friends we’ve made here you will be missed and thank you for being part of our lives. 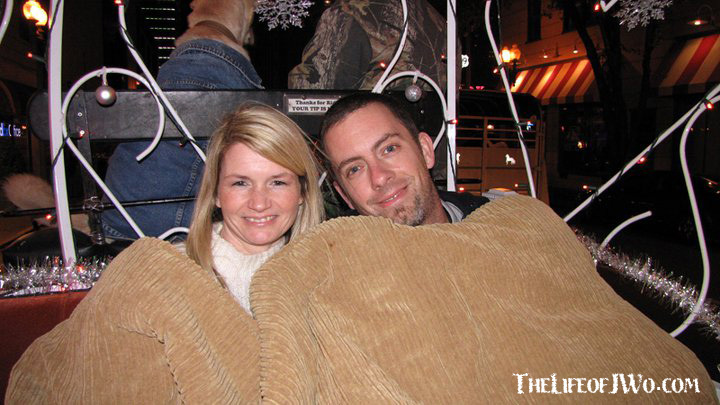 Tammy and me on a carriage ride in Memphis in December of 2010. Gallery | This entry was posted in Daily Life and tagged daily life, family, humor, life, Music, Postaweek2013, Travel. Bookmark the permalink. What! You’re living Chi-town area? Wow. Happy for your new chapter, sad you guys won’t be future theme parties at Chez Calarco. You are an amazing writer and have much to be proud of. Wishing you and Tammy all of the best life has to offer! Yay! Congrats on your new job and a great new chapter! After 13 years, a change sounds scary, but it sounds like the time is right. Looking forward to hearing about your new adventures. Thanks… Tammy’s wanted to move South for a while, for the weather if nothing else, and this opportunity just kind of showed up out of the blue. It’ll be hard to leave but we’re looking forward to our new adventure. Holy Cow! What an adventure! I know one thing…you’re bound to be warmer in Memphis. Congrats on the new job! Tammy is definitely looking forward to the warmer weather, especially after it seems to have snowed more since I got the offer than it has in the last 2 months!! Congratulations!!! Best of luck to you guys on this next chapter! Memphis! WOW! It’s going to great! We’ve been to Memphis a lot, but more in a checking out Beale Street, eating at Rendezvous (BBQ), going to Graceland kind of way. We are very excited about having all of those things in our backyard now. Thanks visit my blog Ajaytao2010@wordpress.com. Browse through the category sections, I feel you may find something of your interest. Thanks for stopping by and I’m glad you enjoyed the visit. I definitely will check out your site more and if it’s like what I already saw then I know I’ll enjoy it. Thanks… It’s gonna be hectic for the next couple of weeks but it will be nice to be closer to my family and old friends. Wow, that is great news on the new job!! May the packing and moving be painless. We’re getting excited… Tammy’s last day of work is Friday (talk about the ultimate Valentine’s Day gift!!) and we are heading down to check out apartments next week. I definitely will be updating everyone on how it goes. Thanks for stopping by and for the link. I grew up in Tupelo so I know a little bit more about the Memphis area than my wife, but so much has changed since I’ve been in Chicagoland.